It only seems like a few weeks ago I was buying everything from Athena’s uniform list for starting primary school, and suddenly here we are a just over a year later (because I am not half as organised this year as last!) checking what fits and re-purchasing things she’s outgrown. The list of things that need replacing is long… her trousers (though she’s told me she doesn’t want to wear these this year and stick with skirts and dresses) all her P.E Kit, most of her white Polo shirts as they’re stained with board marker and pasta sauce splodges and of course, her shoes. 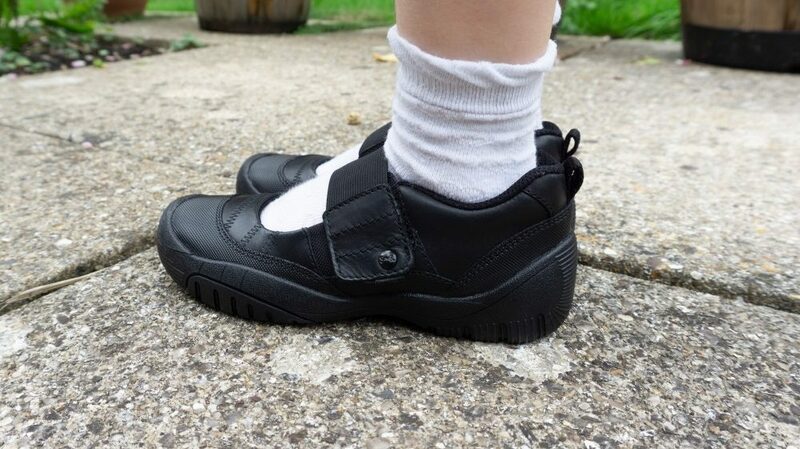 Athena went through four pairs of shoes in Reception year, two were completely ruined beyond any more wear, one was a pair of Dr Martens boots she wore in winter term (and also scuffed the toes up beyond belief – how do adults make DMs last a lifetime but my then-four-year-old ruined them in under 3 months?) and a final pair that she outgrew whilst they were still in a fairly decent condition. Oh! 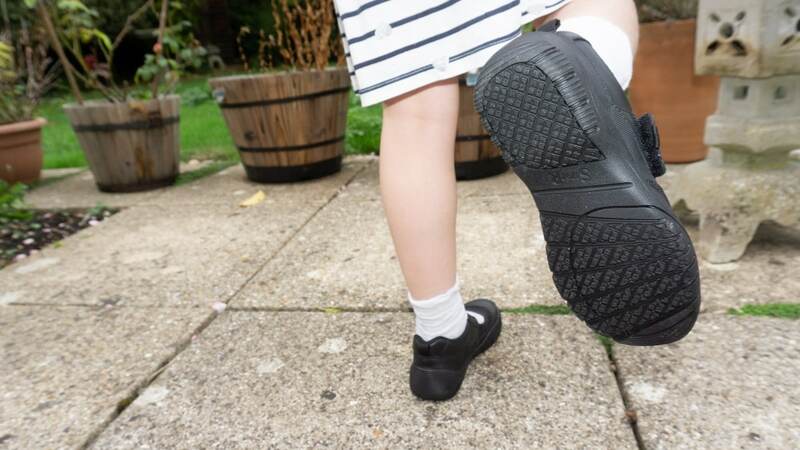 she also managed to wear a pair of wellies to death so that one sprung a leak – even though she only wore them AT school on the rare occasions they had outdoor wet play, not on the way to or from school… HOW! For a ‘girly girl’ who has started to only want to to wear skirts and dresses she sure does know how to put her shoes through their paces! I am very happy that she loves to run, jump, climb and that she doesn’t have to worry about ruining a pair of shoes because she knows I’d never let her go to school in shoes that are uncomfortable or leaky. 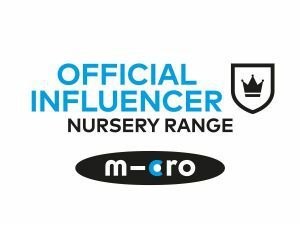 Startrite have just launched their ‘Toughest Ever School Shoes’ featuring eight new styles that are designed to withstand anything a kid can put them through! 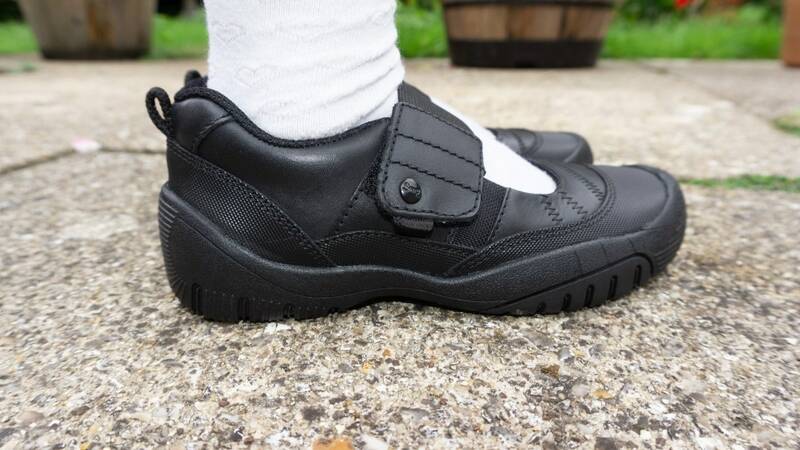 They’re all designed using premium materials, with a wrap-around anti-scuff heel and toe bumper. Athena picked the ‘Launch’ style which is the girliest looking of the new styles (I didn’t expect anything less from her) which is a take on the classic Mary Jane style, so an open area on the top of the foot with cross over strap. 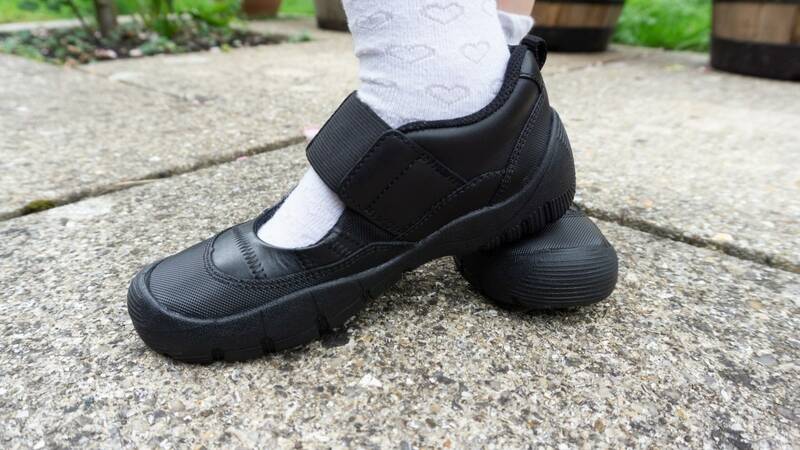 In fact there is a wide elastic under the strap for extra support, meaning if the strap came off when she was hurtling about or climbing something the shoes would stay firmly on! 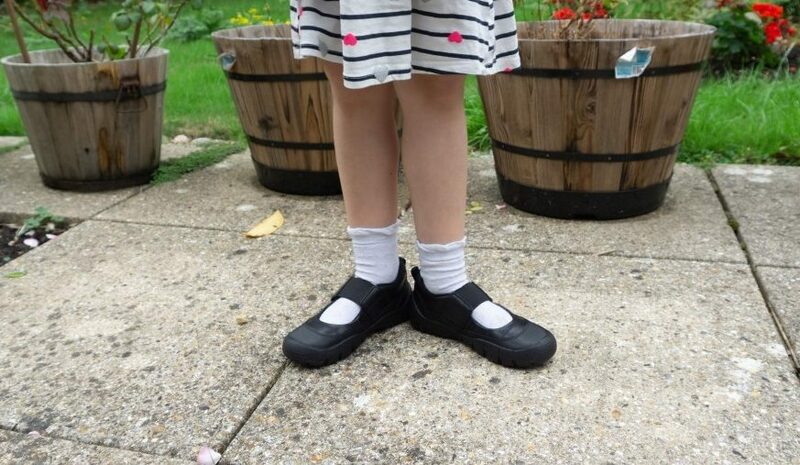 They are slightly heavier than the school shoes she has worn in the past, but as she wore DM boots last winter I’m not worried that they’ll be cumbersome for her, and they’re fairly streamlined in style, and she’s commented on the soft insole. Padding round the ankle means I am fairly sure she’ll get no rubbing and she’s been wearing them around the house on and off for a few weeks and been fine, plus a few short trips out. Although the soles are thick they’re really flexible due to the ridges on them. Obviously we’re not back at school yet so she’s not given them the baptism of fire, but I have set a reminder to update this post at half term with a photo of what they look like after 6 weeks of use! The ‘toughest ever’ range are available in widths E-H and sizes infant 10 to ‘adult’ 4 including half sizes, and the best way to work out your child’s foot size if you’re buying online is to use the measuring guide – you can print one out and then input the measurements into the website, or if you have an iphone then use their handy app and work out your child’s foot size in a few clicks! Once you’ve worked out the size and bought the shoes there’s a fit guide too, which tells you what to look out for to ensure a perfect fit, which includes a video guide too. We were sent a pair of shoes for the purpose of this review.